Literacy professor, educator, children's author, poet, musician, and digital literacies researcher. 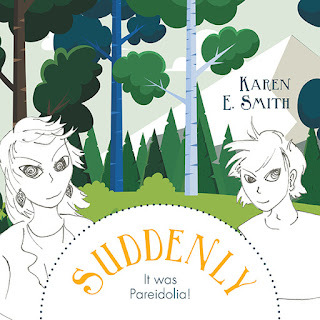 Third Children's Book by Karen E. Smith: entitled Suddenly, It was Pareidolia! Thank you, all, for attending the February launch of my third children's book entitled Suddenly, It was Pareidolia! We were able to raise some dollars for Nature Manitoba at this event in support of children's nature literacy. All my books support nature literacy and I am on the board of Nature Manitoba. I hope you can come. A reading and short presentation will take place starting at 11:00 am followed by signing and personal conversations with the author/illustrator/photographer. . . Me. of, Great Gray Owls. It begins with an illustrated rhyming story and then finishes with information text/photographs about the human "wise owls" of Canada represented in the story and photos of Great Gray Owls. A Great Gray Owl named Earl Gray awakens on a sunny day. Knowing that it is too early for owls to rise, he closes his eyes and begins to count his blessings as he tries to fall back to sleep. His blessings include his health, his friends, his mate called Lady Gray, and their six offspring: Louis (Riel), Tommy (Douglas), Nellie (McClung), Gabrielle (Roy), Duff (Roblin), and Izzy (Asper). Earl and Lady are pleased that their offspring grow up to make the world a better place. Scroll down to see the links for all places for shopping and ordering Karen E. Smith's books. 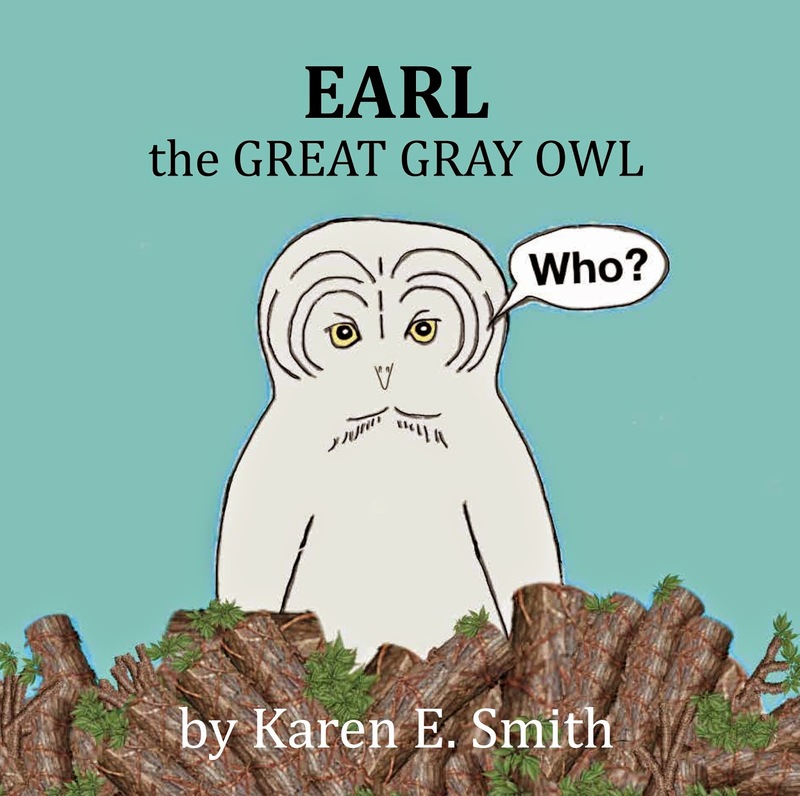 Earl the Great Gray Owl is a transliterate book connecting story and information texts. The book is written for adults and children to enjoy together. Great for the budding naturalist. 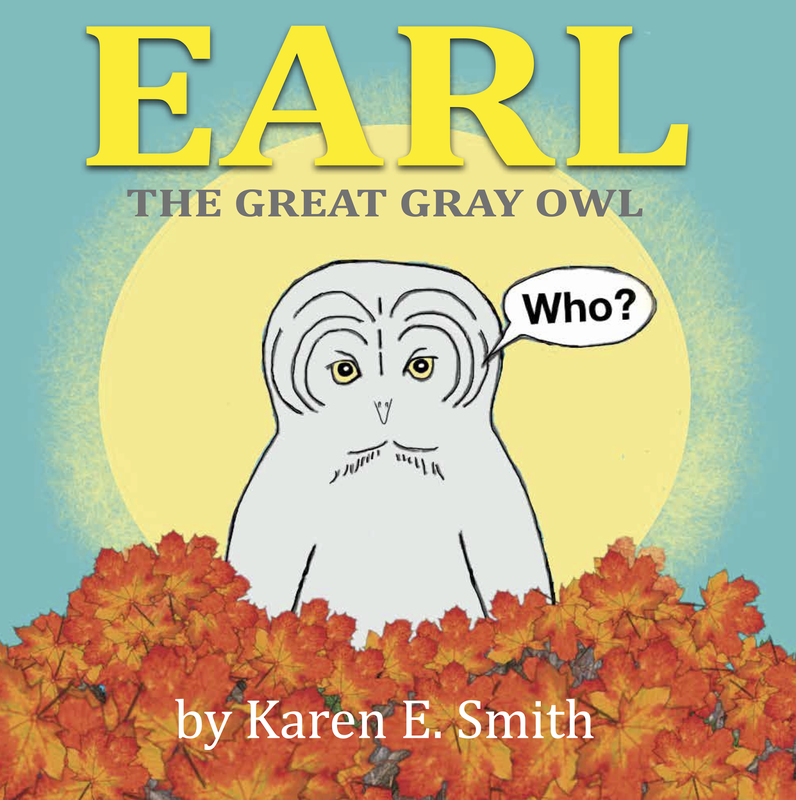 Written and illustrated by Karen E. Smith. The book features live-owl photos by Dr. James Duncan and Mr. Dennis Swayze. The book and its author were recently featured at the International Festival of Owls in Houston, MN. Dr. Smith has presented at over 100 schools for I Love to Read month (February). Stay tuned to this site - the Owl Song that goes with this book is also available. 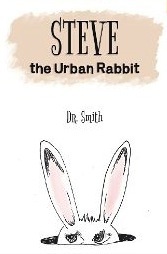 Steve the Urban Rabbit is a children's book written by Karen E. Smith. All illustrations, photographs, and text are by the author. If your child likes rhyme then this book is a great choice. The first half of the book contains a rhyming story and the second half of the book includes facts about house rabbits and backyard "wild" rabbits. Themes in Smith's books include anti-bullying and Nature Deficit Disorder (NDD). Steve the Urban Rabbit is appropriate for ages 3-12. The next 2 children's books are coming in 2015/16. Smith's children's books are prequels to her literacy research book, also to be launched in 2016. Google Play (click here) and many more MP3 release sites, 101 in total. Smith's book engages parents and their children in reading about nature in our own midst. We tend to forget that both urban and rural settings contain animals, insects, and plants which are all interesting subjects for young readers, particularly boys. 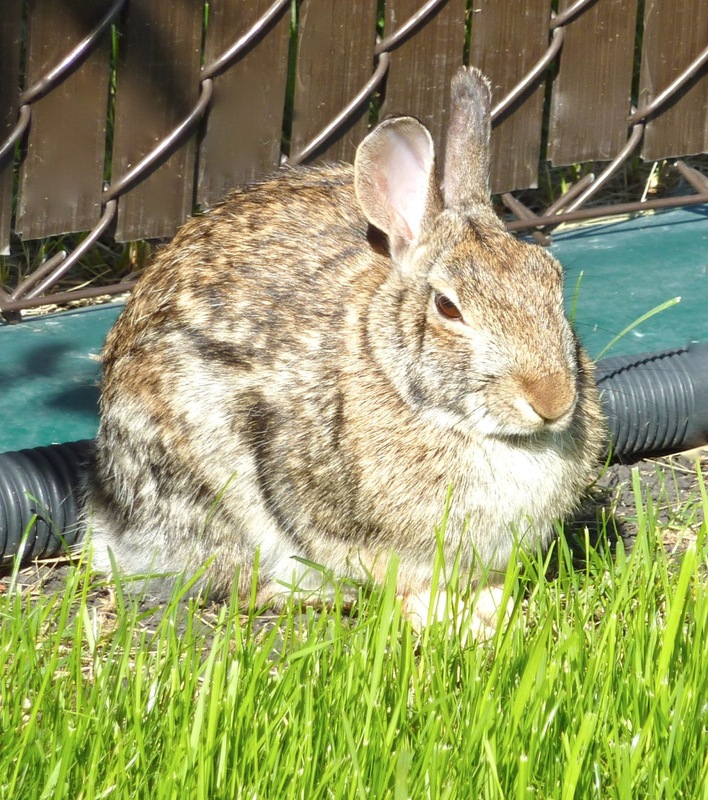 Photos in this book also include rabbits from the University of Victoria lawns and bushes. Most important is that this book is affordable in both paper and e-book form. Get both and help your child learn to read in both paper book and electronic formats. Today, parents are faced with a dilemna: Do we teach our kids to read with paper or electronic books? Having this book in both forms will help your child gain a firm stance in transliteracy (reading in and across the variety of materials). Below is a photo of the real-life Steve taken in the author's own backyard. Steve says, "We can talk!" 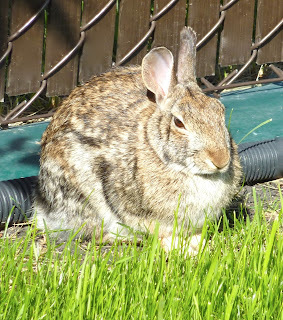 Find out what friendly advice he has to say to the dog about "their ecological domain" in Steve the Urban Rabbit. This book can alternatively be used to transmit an anti-bullying message since the rhyming part it about getting along despite differences. Happy reading! Some of you have asked. Why did I author my first book as Dr. Smith? You will notice that the book is dedicated to my Grandfather who was bilingual and an active musician (fiddler). He was never provided the opportunity to read or write as he grew up; yet, he highly encouraged his children and grandchildren to do so, providing them with opportunities that he missed. In just two generations, one of his grandchildren is a doctor of literacy. That's me. I authored the book with Dr. to honour my grandfather. Yes, literacy is inter-generational. If you can read this, please encourage children to read and thus keep the cycle going in their families/your family. Steve and Earl are the first 2 books in the series of 15...more to come. Happy reading! Merron Chorny Award: For Outstanding Contributions to the Teaching of English. Presented by the Canadian Council of Teachers of English Language Arts (CCTELA). Official Nominee for the Lieutenant Governor's Medal for Literacy 2013. Nominee pin received at the Lieutenant Governor's Mansion on June 30th, 2013.
International Music Festival. Eleven gold medals for children's and young adult choir performances as director. Three gold medals - International Jazz Festival. copyright (c) 2018 Karen E. Smith All rights reserved. Published by Maven Media maven.media@shaw.ca. Powered by Blogger.